The last day for ALL STUDENTS to preorder a yearbook for this year is Friday, December 21st. Yearbooks are $125 – cash, check made out to WHS, or credit/debit card accepted. 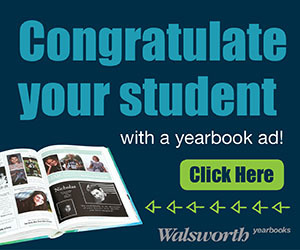 This year the Woodbridge High School yearbook will be selling senior congrats ads online! We hope this process will be more convenient for everyone. Please keep an eye on your inbox for reminders from our publishing company Walsworth Yearbooks. Ads can now be easily made by parents using the template online or your can choose to have our talented yearbook staff create one for you using the photos and message you provide online. To purchase and create your senior ad for the 2018/2019 yearbook please go to www.yearbookforever.com and enter Woodbridge High School. All senior ad orders must be placed by December 21st and space is limited!